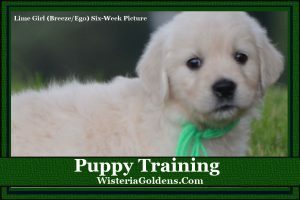 This is a list of the Puppy Training Guides we have published on Wisteria Goldens’ Blog. 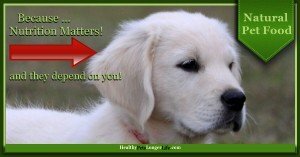 The Listing page will provide you with answers to the most commonly asked questions about how to transition your puppy from Wisteria Ranch to your Forever Home, Nutrition, Socialization, Playtime, Training, Travel, Memories (Journal), and Health Care. The list also includes some of our most popular Blog posts about caring for your dog as well. You’ll find a variety of topics like these popular guides. 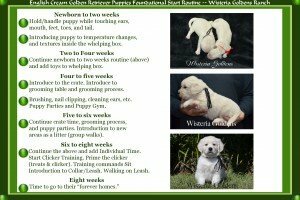 Bringing Home New Puppy Transition Tips (preparation and welcoming your puppy to their Forever Home). Puppy Love Head to Toe (a massage guide). 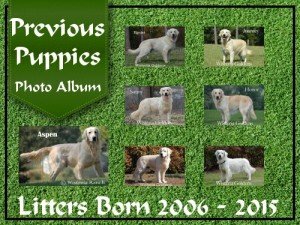 Puppy Photos — Tips for Getting a Great Shot (taking great pictures for your puppy’s memory book and family album). Let us know which guides are most helpful to you by providing a comment or joining the conversation on our Facebook page. We’d love to hear what information we can provide for you in helping to raise your puppy or keeping your dog healthy and happy. Start exploring here on our Puppy Training Guide Listing. Visit our resource page: (http://wisteriagoldens.com/lifes-abundance/) and let me know if you have any questions.